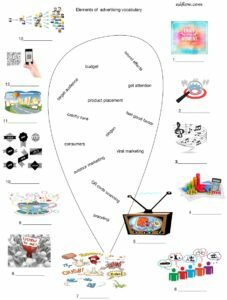 Advertising and branding vocabulary and speaking exercises help students familiarize themselves with language, expressions and terminology necessary to get ahead in the corporate world. 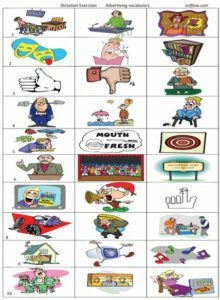 This is a business English ESL exercise introducing and exploring the language and vocabulary of advertising. Students try to match the vocabulary with the appropriate pictures. This exercise works well as an icebreaker at the beginning of a lesson. Click on the image or the link to download the printable PDF file. This is an ESL speaking and writing lesson for talking about advertising. First, students write five survey questions about advertising. There are some examples of questions on the first page of the PDF. When they have written five questions on Page 2 of the PDF, they can walk around the class asking classmates their questions and noting down their answers on the worksheet. Finally, they write a short report from their survey question answers. This is a fun communicative exercise that allows students to mix freely. 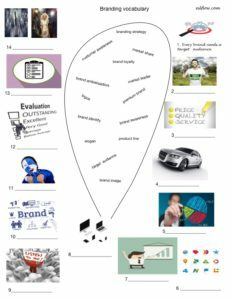 This is a business English ESL lesson exploring advertising language . it includes a dictation exercise, a vocabulary and picture matching exercise, a questionnaire using advertising expressions, a pronunciation exercise and more. 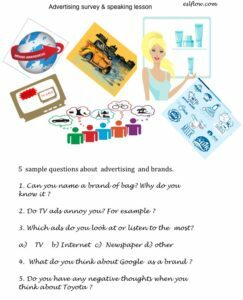 This is an ESL speaking activity, questionnaire that encourages discussion around the topic of branding.